HUNTSVILLE, AL – The final weekend of the season, still with something to prove, the Marksmen traveled to Huntsville, Alabama. Fayetteville needed to end the four game slide they were on, and needed to do it quick. Moderately quickly in the first period, the Marksmen showed up. Tyler Palmer found the net, only five minutes into the game. Fayetteville, leading 1-0 needed to try and keep that scoring ability all game for a chance to break the skid. Newly acquired goaltender Jason Pawloski got the start in net for the Marksmen. Pawloski really proved why he could play a key role on this team come playoff time, stopping the first 12 Huntsville shots. Brian Bowen would be tripped up on a chance to the net, and find himself on a Penalty Shot – but a weak-shot would be stopped by the Havoc goaltender and keep it 1-0. The sheer number of shots from Huntsville finally got to the Marksmen and the puck went through the net. 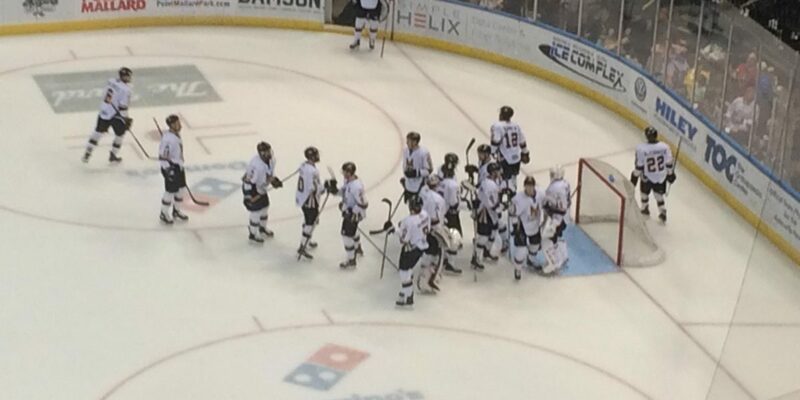 Almost 10 minutes after Fayetteville’s opening goal, the Havoc tied it up at one. Other than a late period penalty for the Marksmen, nothing came after the Huntsville goal. The horn sent the teams into their dressing rooms, game tied at one. Coming out of the break, the game was almost exactly even. Both teams had scored one goal, the shots were only a few apart and the penalties were two minutes difference. The beginning half of the second period was bombarded with penalties. In just the first seven minutes, both teams got a penalty; Fayetteville with two. Although the penalties happened, nobody could take advantage and score on special teams. Once the penalties died down, the Havoc got to work. They sent seven-straight shots on net, leading to their second goal of the game, and second from Kyle Sharkey. Eight minutes still remained after the goal, but nothing was made of the remaining time. The second period ended and the Marksmen trailed 2-1. A key-game down the stretch, Fayetteville needed to win badly if for nothing more than momentum. The third period was possibly their best period of hockey all season. The league leaders in power plays finally got their work in, scoring with an advantage early in the period. Jake Hauswirth found the net, tying the game at two. Fayetteville’s penalty kill worked like a charm, defending all five of Huntsville’s power plays, including two key kills in the third period for a :54 five-on-three. The tie stood for 11 minutes, then the Marksmen got it going. With 6:24 on the clock, Brian Bowen found the net on a beautiful breakaway opportunity, giving Fayetteville the lead for the second time. The revitalization of the Marksmen, and the outstanding third period showed that they could be a team to fear come next week. With the lead in hand, the Marksmen were six minutes away from their first win since mid-March. Fayetteville’s defense held strong, only allowing three Huntsville shots in the final six minutes of the game. After looking at all their opinions, the Havoc pulled their goalie and tried to make it work with an extra skater. The plan didn’t work out well for them, and led to the finishing touches for the Marksmen. An empty net goal from Taylor McCloy with 1:43 left in the game put the nail in the coffin, securing the win for Fayetteville. The clock hit zero and the Marksmen were finally winners again. The much needed win put an end to recent woes of the last four games for Fayetteville. This win also gave Head Coach Jesse Kallechy his first win against his former team, and did it in his homecoming to the Von Braun Center. The environment won’t be as welcoming tonight for Coach Kallechy and the Marksmen. Fayetteville looks to close the regular season on a high note, with a sweep on the line against Huntsville tonight. Puck drop is once again at 8 P.M. (EST). Join us for the Home Away From Home Watch Party at On-After Sports Bar & Grub, or listen live with the Voice of the Marksmen Shawn Bednard on MarksmenRadio.com at 7:45 P.M.